For me, a lot of Japanese rap ends up the missing mark not because artists are taking heavy cues from American artists, but because they forget to build from that base and find their own voice (which, funny enough, is a trapping of artists around the world, and in America too). It doesn’t take long to figure out who Sleet Mage gets inspiration. The Tokyo-based artist draws from the corner of “SoundCloud rap” where emo is every bit as influential as hip-hop, best exemplified by the late Lil Peep (who Sleet Mage followed closely). But on their second mixtape Astral Body Boi, Sleet Mage makes their own voice come through clearly. Across its nine songs, Astral Body Boi features familiar sounds — trap-adjacent beats, Auto-tune smears, an N64-era fairy telling you to, hey, listen. There’s one moment of aggressive release, on the quick-paced “Parimanimage (Freestyle).” Yet Sleet Mage becomes intriguing when getting quieter, which is the direction the tape goes the further it moves along. The beats become centered around guitar, and Sleet Mage’s voice often teeters on becoming a mumbled whisper. “Nostalgic Mikasa City” moves at half speed, while mixtape highlight “Sleepy Trippie Mage” sounds exhausted, the sonic equivalent of sagging eyelids. It’s just the right backdrop for Sleet Mage’s delivery. Where Sleet Mage finds their own identity is with the vocals themselves. It’s not simple replication of the emo-glazed anger appearing in “SoundCloud Rap,” but I’d argue it veers closer to Japan’s domestic rock output — and, unless Sleet Mage’s hair is tripping me up, a little bit of the drama of visual kei? Take “Mmoonn,” above. There’s no angst, just longing delivered via lines that would fit in a back number song (“when I think of you / you’re just like the moon”). Yet the way Sleet Mage delivers it — and how it gets interrupted by speedier verses — sets it apart. Same goes for the icy “I don’t say good bye” and especially so on closer “We Will All Die,” a piano-driven number that goes all in on its over-the-top emotion (see: the title) that reveals itself as…a critique of Japanese society, complete with big climax and the tenderest delivery of “skrrt skrrt” I’ve ever heard. 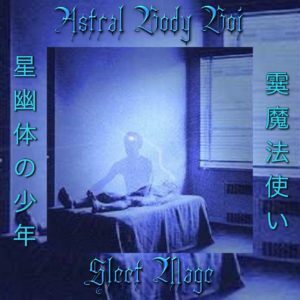 Alongside Gokou Kuyt’s #teendreamtape, Astral Body Boi stands as a late hint at where Japanese rap…or, at least the edges of it…will go in 2018. And that’s a good sign. Get it here, or listen above.